There are four broad categories of treatment applied to sapphires, at least for the time being. It is not impossible for gem manufacturers to come up with new treatments but, let us talk about what is available now. Sapphire and ruby come from the same mineral, corundum. These gems have always been heated to improve their clarity and color, this heating process was simple and did not involve the use of any chemicals or other reactive agents. Let us refer to this form of treatment as 'conventional heat'. Since the effect of this form of heat treatment delivers effects that are permanent and also, does not make the gem weaker or less durable - it is well accepted by the trade. Gem experts also give the nod to conventional heat treatment for sapphires and rubies. In terms of ethics it is a good idea to always disclose the use of conventional heat treatment for sapphire gems but, most sellers do not do so. If it were not for the other forms of sapphire treatments that came to be adopted, non-disclosure might not have been a big issue. You could just safely presume that your sapphire was put through the conventional heat process. Unfortunately the situation is more complicated than that since, there are alternate treatments available and most of these actually reduce the value of the gemstone. The next generation of treatments for sapphire gemstones relied on diffusion as a process, the first to come was 'surface diffusion'. Without getting technical and confusing, here is the simple explanation for the surface diffusion treatment applied to sapphires. Natural sapphire with low color saturation and significant internal blemishes, was cut and polished in the usual way. The treatment was then applied to improve the surface color of the sapphire, the gem would end up with an amazing color but, this would exist only on the surface of the stone. The nice color also managed to cover up or at least soften, the visibility of the many blemishes inside the gem. You might have guessed why the sapphire needed to be cut and polished before, the surface diffusion treatment was applied. This is because with color being imparted only to the surface by the treatment, any cutting or re-polishing operation would alter the surface and thereby take off the color. Gem manufacturers experimented with the surface diffusion process for very long, they were looking for a similar process that could force the color derived from the treatment to penetrate deeper into the gemstone. The idea was that, with this deep color effect, the gem could easily be cut or polished without fear of losing color. This would work especially well, if the a re-cut or re-polish that was to be done was a minor task. Success came in the form of the bulk diffusion or lattice diffusion process. Beryllium along with a special flux was added to the heating process used for sapphires, the treatedstones looked amazing and did not sacrifice too much in terms of toughness and durability. Some technical experts refer to sapphires treated in this way as beryllium treated sapphires. The important thing to note about beryllium heated sapphires is that, it is very necessary to inform buyers when such gems are sold. Sellers are often tempted to sell beryllium treated sapphires by declaring them as, conventionally heated stones. This obviously gives them high profit margins because, beryllium heated blue sapphires would cost around 40% to 60% less than conventionally heated sapphires with a similar look. It does get to be a challenge for buyers since, not every gem testing laboratory is equipped with the required expertise and equipment to differentiate between, conventionally heated and beryllium heated sapphire gemstones. The latest treatment to be applied to blue sapphires probably has its origins in the same country, that brought us fissure (glass) filled rubies. Substantial glass filled (also called fissure filled) blue sapphires, are coming from the gem cooking ovens of Chantaburi in Thailand. Fissure filled blue sapphires, have the same characteristics as fissure filled ruby gems. These gems need the same care and attention that is recommended for fissure filled ruby gems. Prices are not very expensive but, sellers should make clear disclosure and charge the appropriate price. As you can see from the above image, these beryllium treated blue sapphires look stunning. Gem sellers often use the 'ceylon sapphire color' of beryllium heated sapphire gems in their sales talk, to make them more appealing to buyers. Testing these gems needs highly sophisticated equipment and a high degree of gemstone knowledge. Though durability of the sapphire that makes it through this treatment is not significantly compromised, the price is very attractive when compared to sapphires treated by the conventional heat process. Sapphires used in this process are natural gemstones, not synthetic. 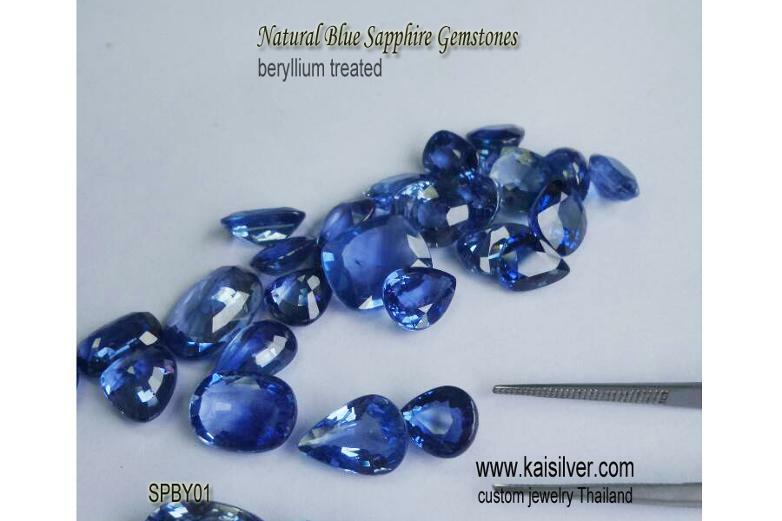 The beryllium heat treatment does not significantly alter the durability of the sapphires. The treated sapphires have color that goes deep into the stone, not just on the surface. The color and clarity of the sapphires are highly enhanced. Beryllium heated sapphires would cost around 40-60% less than conventionally heated gems. Disclosure of the treatment should be made when sapphires treated in this way are sold. Many gem testing laboratories identify these sapphires as conventionally heated. Advanced knowledge and equipment is required to correctly identify beryllium heated sapphires. The gems are worth buying if they are rightly disclosed and reasonably priced. Kaisilver can custom make jewelry with these gems on specific request. Kaisilver: Widely accepted to be the leading online provider for high end custom made jewelry, we at Kaisilver custom make all types of jewellery with your designs or ours. With more than 2 decades of intense gem sourcing experience and complete command over gem cutting, we place no limitation on your choice of gemstones. Both gold and 925 silver jewelry are assured of the same quality standards for workmanship and gemstones. You can contact our team of experts at sales@kaisilver.com and request for suggestions or information, on any issue related to gems and jewelry. The team is encouraged to provide solutions and knowledge rather than, to push for sales and revenue. It is therefore a good idea to take advantage of their expertise and then, work with a jewelry provider that makes you feel most comfortable. We are fine if the order does not ultimately come to us as long as, you get good value for what you spend.